With Janamashtami just round the corner, Dahi Handi Samanvay Samiti urges participating Govindas to get themselves insured with a Rs. 10-lakh cover by Oriental Insurance. 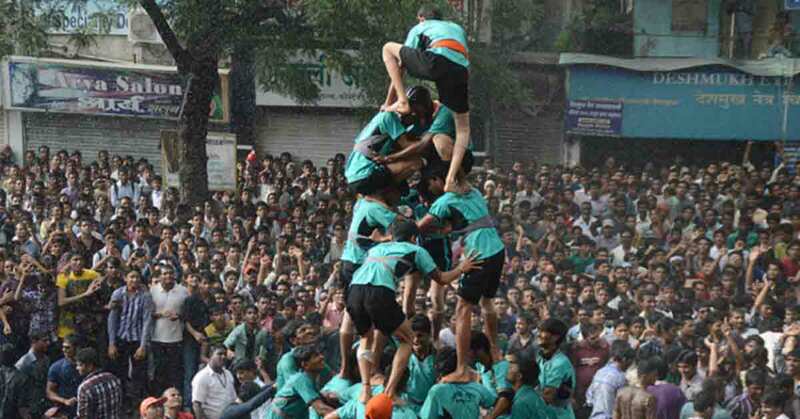 Reportedly, keeping with the Supreme Court’s and the Bombay High Court’s directives last year to boost safety measures during the Janmashtami festival, state-based Dahi Handi Utsav Samanvay Samiti has decided to insure the life of each Govinda with a Rs. 10-lakh insurance cover. The umbrella body of mandals has joined hands with Oriental Insurance Company to offer Rs. 10 lakhs accident and death insurance policy to members of mandals for a premium payment of Rs. 75. The policy will be applicable from the first day of practice until the morning after the Dahi Handi festival. Earlier, insurance coverage extended to mandals was around Rs. 2 lakhs for a premium of Rs. 100. One of the participants has said that he expects the lower premium to encourage more and more people to opt for insurance. The Samitee has also asked the mandals to provide safety belts and helmets to the Govindas and ensure that children below 14 years are not involved in the making of the pyramid. “We must follow the guidelines recommended by the courts. We want the festival to be safe for everyone,” Surendra Panchal from the Samitee was reported saying. Active in pushing for insurance for the Govindas, the seven-year-old organisation has four appointed members who mediate between the mandals, the police and the organisers. The policy will pay out in the event of death, loss of two limbs and/or two eyes and/or permanent disability due to accident while taking part in the sport. A Rs. 5-lakh slab is being proposed for the loss of one arm and/or one eye and/or one leg. Additionally, a Rs. 1-lakh cover is in the talks for hospitalization in case of treatable injuries. According to news reports, Sachin Khanvilkar, assistant manager of Oriental Insurance was quoted saying that last year, 389 mandals had applied for insurance, whereas in this year, 600 mandals are expected to get themselves insured. The move to enhance insurance cover has been seen in a positive light by many industry players and well as citizens, since it provides participants the much-need financial protection in case of any mishaps and encourages them to focus on their financial well-being.